Except today there was a minor hiccup. When I got the the "Comb His Hair" part I noticed a little black dot. Thinking it was dirt, I flick at it with my finger.... only... that doesn't feel like dirt... and it didn't come out. So, I investigate a little more closely... comb the hair aside only to reveal a tick. A flippin' tick! So, I gasp, ShortBus says, "What mommy?" I respond, "oh.. uh... nothing." And, proceed to try to use the comb to coax the little bugger out of his hair. Only, it's not in his hair... it's in his scalp. Yes, my sweet little child has a parasite burrowing into his brain. Obviously, I'm not a big fan of ticks. As a matter of fact, they are in my top three "creatures I hate with a burning passion." Right along with potato bugs and centipedes (or milipedes... all those legs... freaky). So, being the rational, calm person that I am, I send the ShortBus out to watch TV with a banana, and go into his room, close the door, and do the dance. You know the dance.... "omg omg omg! ew ew ew ew!" *shudder shudder* Hands flapping, eyes squinched shut, jumping up and down... the whole nine. Now. What to do about this creature? I have never removed a tick from any living thing... I've never had one even on me, let alone IN me... I haven't even been able to watch as they've been removed from various pets I've had. I just. Can't. Handle. It. The one person I know, who is local, and can for a fact remove said pest from my child is my ex-husband (at the moment, he still lives a block away). Of course, it is 7:15, and I know he's already at work... but, I'll give it a shot anyway. Now, as the phone is ringing, I'm thinking, "This is YOUR child too, and it is very likely YOUR fault he has a tick in his BRAIN, you absolutely have to take care of this right now." Of course, when he answers, I say, "Hey... how's it goin'?" me: "you don't happen to be home still?" ex: "no, I'm on my way to work." me: "ah well, ya know, no big deal, but our son has a tick IN HIS HEAD!" ex: "so take it out." me: "you know how I feel about those things... and it is IN HIS HEAD!" He tells me exactly how to go about taking it out, and says,"so let me know how that goes. Later." At this point, I go to my computer, and call in sick for the first two hours of school. There is no way this is going to be resolved in less than two hours.... mommy has issues. This whole time I'm thinking about CSB and how he's NOT here, and even if he couldn't take it out (hm.. another thing I need to learn about him), he would at least provide rational thought in my moment of crazy. He's definitely good at that. I don't think I have many moments of crazy (no crazy person does), but he's a great balance to my brand of crazy, and has this really wonderful way of bringing me back to 'rational' after allowing me to have a moment of ... not so rational. But, he's in Oakland... and Vacaville is closer... yes, time to call my mommy and daddy. I know they are sleeping (it is barely 7:20 am), but this is an emergency! There is a creature burrowing ever closer to their grandson's brain... and it is sucking his blood... his life force! That blood has half my DNA! The Boy needs it!!! So, I wake up my poor parents, leaving a message on their answering machine that goes something like this: "Good Morning! I'm sorry to call so early, and I'm sure I'm waking you up, but we are having a minor issue this morning, and I could use your advice. So... um... if you get a chance... sometime kinda soon, could you call me back. kthxbye." They call back and advise me to take him to Kaiser. Yes, Kaiser! $25 to get a tick removed! Sounds silly, but at that point, I probably would have paid $125. So, we go to Kaiser, the doctor asks the ShortBus why we were there, SB says "because I have a bug in my hair." Which is exactly the story I told him, "BTW: we're stopping at the doctor's office on the way to school because you have a bug in your hair, and I'd like the doctor to take it out." His response: "Ok. Is it going to hurt?" My response: "It won't hurt you, the doctor is going to use tweezers to grab the bug, but not you. You won't even notice." And, that was that. The doctor took about 4 seconds to remove the thing (I couldn't look), he went to school, and told all his friends he "had a bug in his hair." I went to Starbucks, and got a coffee and a muffin, and sat and tried to relax before going in to work. 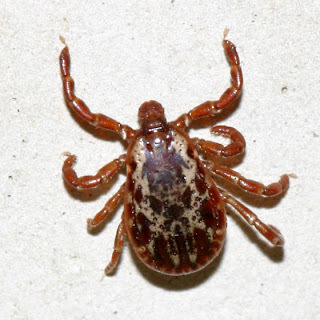 I have had ticks on me after running in a few remote woodsy type places (like stebbins canyon and parts of the western states train). I have never had one in me, however. When my little brother's dog would get ticks we would burn them off with a match. I don't know if you would do that with your kid, however. Giddy- I lurve you! I think our brands of crazy overlap. Glad The Boy is good. "Cause I have a bug in my hair?" Okay eewww. There are a lot of things I can deal with, ticks are not one of them. I don't know if I would be able to hold myself together long enough to get help and not freak my kid(s) out. Ew ew ew ew!! OMG. I would have flipped out. yick yick yick! I hope your muffin didn't have raisins in it. I think I may have had to go to Kaiser as well. hum... I had to remove one fro a friend in elementary school once. But even after I am sure he went to a doctor.